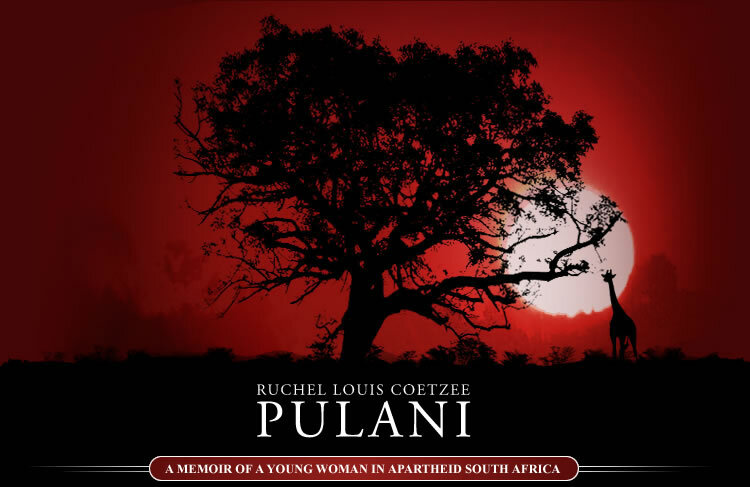 Here's an interview I've had in the queue for a long time: an interview with Ruchel Louis, Jewish author of Pulani: A Memoir of Growing Up in Apartheid South Africa. I met Ruchel at Book Expo America in 2010, and had a great time interviewing her while we sat waiting for the keynote address (it was Barbara Streisand, speaking about her book on interior design). I think Ruchel was the more interesting speaker! 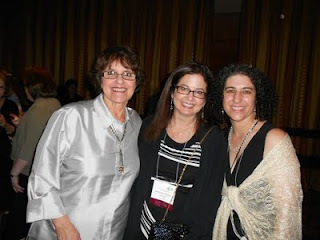 Barbara Krasner blogs at The Whole Megillah. During Jewish Book Month 2011, she is sponsoring the "Write Your Own Megillah "project to encourage Jewish children's writers a la NaNoWriMo. Write 36,000 words of a young adult novel or 18,000 words for middle grade readers between November 21-December 21, and become eligible to win 3-chapter critiques from professional children's editors Stephanie Lurie and Margery Cuyler! 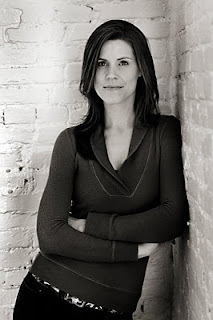 Sarah Darer Littman's novel Life, After, was a 2011 Sydney Taylor Honor Book for teens. Sarah was a guest on the show in 2006 when her debut novel Confessions of a Closet Catholic won the Sydney Taylor Book Award, and it was great to meet up with her again. Her novels are always brave, taking on subjects that others might fear to talk about. Wherever You Go is a finely interwoven novel of three American lives and the unexpected ways they touch each other in the landscape of Israel. I recorded this interview with author Joan Leegant when she visited Boca Raton, Florida for a Jewish Book Network event at the Levis JCC. 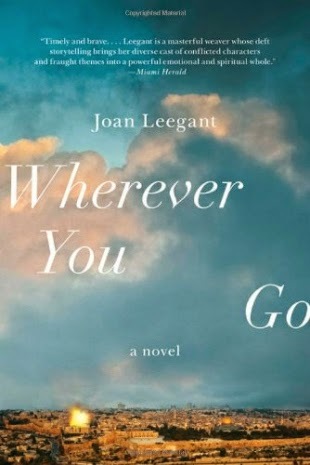 For more information about the book, visit Joan's website at www.joanleegant.com/Leegant/Joan_Leegant.html. This post is written for Round 7 of Library Day in the Life, a project started by librarian blogger Bobbi Newman at LibrarianByDay.net. Librarians across the world explain what they do (it's not just sitting around and reading! ).To see a list of the 200+ participants (of which I am Number 69), visit http://librarydayinthelife.pbworks.com/w/page/42017739/Roun. I am the librarian and computer teacher at Congregation B'nai Israel of Boca Raton, Florida, where I work with the synagogue's preschool and religious school. During the school year, a typical "day in the life" includes teaching up to ten preschool classes in a row, performing storytimes or conducting lessons on computer skills. Later in the day, this may be followed by a visit with religious school classes, using the power of story to connect them with their Jewish heritage. When no students are in the room, I am typically doing lesson planning, maintaining the library's 7000+ volume collection, and working on my podcast, The Book of Life. My days often include other professional work, such as volunteering with the Association of Jewish Libraries, of which I am the Vice President / President-Elect. Had a very productive meeting with my director about revamping the preschool blog. Brainstormed for a possible new library enrichment project: preschool literacy centers, wrote up a proposal and started seeking out materials that could be used in such centers. Checked in and shelved returned library books. Wrote a book review for School Library Journal, to which I am a regular contributor. Also received editorial comments on an article I am currently writing for SLJ. Got up on a stepstool and wrote the names of donors onto the artificial (but real-looking) leaves on the Tree of Knowledge that is built into the storytime corner, using a gold pen. I'd also like to note that today the library was used by early drop-off child care, by a summer camp group who came by to read a story, and by the bar mitzvah tutor who worked with two different students, helping them to practice chanting their Torah portions. Author Ann Koffsky talks about her newest picture book, Noah's Swim-a-thon, about lifeguarding at camp, and about the nutty things adults say to get kids to put their faces in the water. 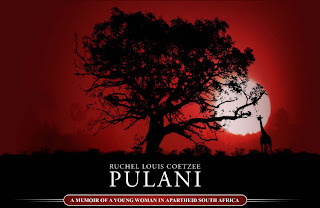 For more info about the book, visit URJ Books & Music at http://urjbooksandmusic.com/product.php?productid=12179. The Jewish Book Carnival is a monthly event where bloggers who blog about Jewish books can meet, read, and comment on each others’ posts. The posts are hosted on one of the participant’s sites on the 15th of each month. For the month of June, 2011, our host is Erika Dreifus at My Machberet (Hebrew for "notebook"). She's got a great round-up of posts from all over the blogosphere. You'll find author interviews, book reviews, suggested reading lists, reflections on Jewish Book Network experiences, and various Shavuot-themed posts. 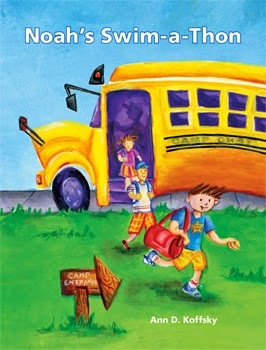 Visit My Machberet for the June Jewish Book Carnival! Enjoy, and please leave comments for the bloggers - they love feedback! A double dip of interviews with Rona Arato, author of Mrs. Kaputnik's Pool Hall & Matzo Ball Emporium. The Jewish Book Carnival is a monthly event where bloggers who blog about Jewish books can meet, read, and comment on each others’ posts. The posts are hosted on one of the participant’s sites on the 15th of each month. 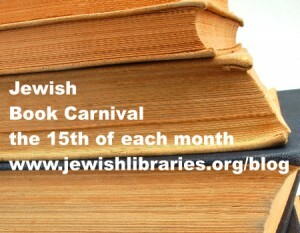 For April 2011, our host is the Jewish Book Council blog at http://jewishbooks.wordpress.com/2011/04/15/jewish-book-carnival-april. There you will find links to Jewish book reviews, author interviews, and other booky Jewishy goodness (including a link back to The Book of Life's interview with Ann Redisch Stampler on The Rooster Prince of Breslov). Please visit the Carnival, comment on the posts, and if you'd like to play next time, send a booky Jewishy link from your own blog to our May host, The Whole Megillah, at BarbaraKrasner@att.net. Author Lesley Simpson offered to interview herself, and I couldn't pass that up! 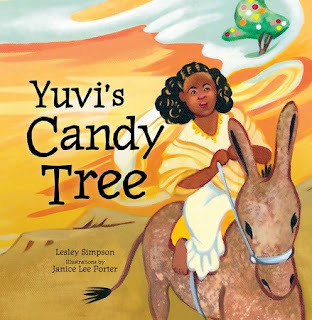 She talks about Yuvi's Candy Tree (Kar-Ben, 2011), a picture book on Ethiopian Jews fleeing to Israel based on the true story of Yuvi Tashome. 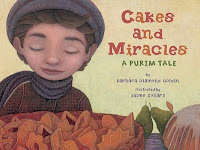 With its strong Exodus themes, it makes a great tie-in to Passover; it's also a universal immigration story and a good illustration of the diversity of the Jewish family. Yuvi's Candy Tree is a PJ Library selection for ages 8 and up. You can take a look at their reading guide here. I bumped into Ann Redisch Stampler at Book Expo 2010. 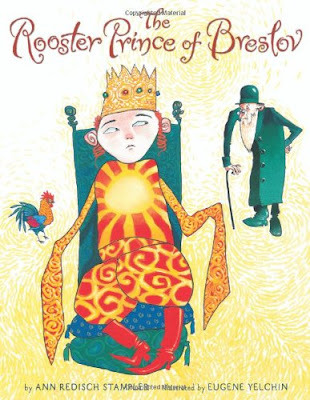 Ann is the author of the Jewish folktale picture book The Rooster Prince of Breslov, which (a while after our interview) was named winner of the National Jewish Book Award's 2010 Louis Posner Memorial Award for illustrated children's books. 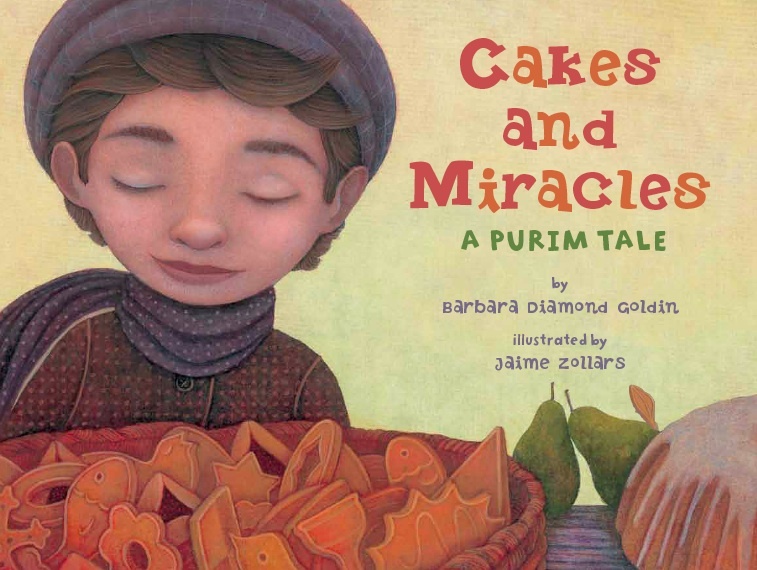 It was also named a 2011 Notable Children's Book of Jewish Content by the Sydney Taylor Book Award Committee. Ann was a guest on The Book of Life in 2007 when she won the Sydney Taylor Honor Award for Shlemazel and the Remarkable Spoon of Pohost. One of the many interesting people I met at last year's Book Expo America was Carol de Giere, author of a biography of Jewish superstar composer Stephen Schwartz. Her book is entitled Defying Gravity: The Creative Career of Stephen Schwartz from Godspell to Wicked. Carol shared interesting tidbits about her time backstage on Wicked and about the Jewish influences on Schwartz's work. Check out her website at caroldegiere.com and check out her book's website at defyinggravitythebook.com. The song "Defying Gravity" from Wicked, as performed at the Tony Awards. The Sydney Taylor Book Award will be celebrating and showcasing its 2011 gold and silver medalists with a Blog Tour, February 6-11, 2011! Interviews with winning authors and illustrators will appear on a wide variety of Jewish, kidlit, and family-interest blogs. For those of you who have not yet experienced a Blog Tour, it's basically a virtual book tour. Instead of going to a library or bookstore to see an author or illustrator speak, you go to a website on or after the advertised date to read an author’s or illustrator's interview. Below is the schedule for the 2011 Sydney Taylor Book Award Blog Tour. Please follow the links to visit the hosting blogs on or after their tour dates, and be sure to leave plenty of comments! The Book of Life will be participating on Tuesday, February 8, hosting an interview with Jaime Zollars, illustrator of the Sydney Taylor Honor Book Cakes and Miracles: A Purim Tale by Barbara Diamond Goldin. For the full list of this year's winners, honors, and notable books, please visit the Association of Jewish Libraries website. Here is a press release from the Association of Jewish Libraries about the newest winners of the Sydney Taylor Book Award! Please note that The Book of Life has an interview with Barry Deutsch, winner in the Older Readers Category for Hereville, posted below. 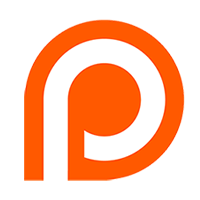 Interviews with some of the other recognized authors were recorded in 2010 and are in the queue to be released on the podcast in the coming year. Music: "Conflict in the Middle Table" by Michael Stampler. Howard Schwartz and Kristina Swarner, author and illustrator of Gathering Sparks, Barry Deutsch, author and illustrator of Hereville: How Mirka Got Her Sword, and Dana Reinhardt, author of The Things a Brother Knows are the 2011 winners of the prestigious Sydney Taylor Book Award. The Sydney Taylor Book Award honors new books for children and teens that exemplify the highest literary standards while authentically portraying the Jewish experience. The award memorializes Sydney Taylor, author of the classic All-of-a-Kind Family series. The winners will receive their awards at the Association of Jewish Libraries convention in Montreal this June. Schwartz and Swarner will receive the 2011 gold medal in the Sydney Taylor Book Award’s Younger Readers Category for Gathering Sparks, published by Roaring Brook Press, an imprint of Macmillan Children’s Publishing. Both are second time winners. 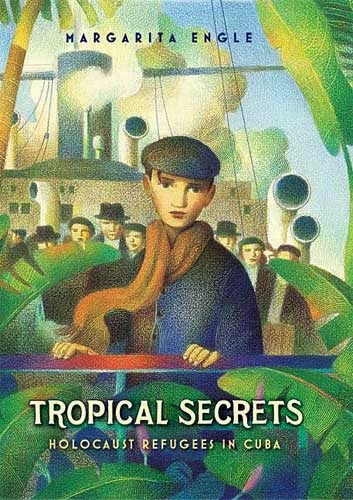 In 1992, Schwartz received the Sydney Taylor Book Award for The Diamond Tree: Jewish Tales from Around the World. 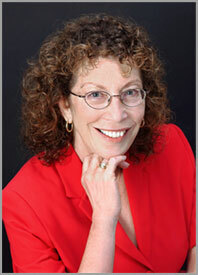 Swarner earned the 2008 Sydney Taylor Book Award for her illustrations in The Bedtime Sh’ma: A Goodnight Book by Sarah Gershman. Reinhardt will receive the 2011 gold medal in the Sydney Taylor Book Award’s Teen Readers Category for The Things a Brother Knows, published by Wendy Lamb Books, an imprint of Random House Children’s Books. Levi’s older brother Boaz is a military hero, and Levi has always lived in his shadow. Now Boaz is returning from war and it seems everyone thinks Levi is the luckiest boy in town. 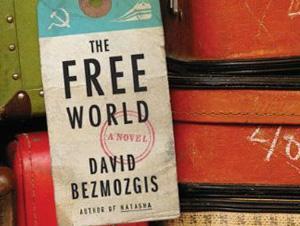 When Boaz refuses to engage with his family and barely leaves his room, Levi wonders if his brother will ever be normal. Committee member Rita Soltan said, “Reinhardt creates a moving portrayal of teen characters … She provides balance through Levi and Boaz’s Israeli grandfather, who served in Israel and has experienced war and suicide bombings. Realistic and subtle, her story unfolds with enough suspense, sardonic humor and pathos to keep readers focused until a conclusion that leaves room for pondering interpretation.” In 2007, Reinhardt earned a Sydney Taylor Honor Award for A Brief Chapter in My Impossible Life. Nine Sydney Taylor Honor Books were named for 2011. For Younger Readers, the Honor Award Winners are: Modeh Ani: A Good Morning Book by Sarah Gershman with illustrations by Kristina Swarner (EKS Publishing), Emma's Poem: The Voice of the Statue of Liberty by Linda Glaser with illustrations by Claire A. Nivola (Houghton Mifflin Books for Children), and Cakes and Miracles: A Purim Tale by Barbara Diamond Goldin with illustrations by Jaime Zollars (Marshall Cavendish Children). Sydney Taylor Honor Award Winners for Older Readers include: Resistance by Carla Jablonski with art by Leland Purvis (First Second, an imprint of Macmillan Children’s Publishing Group), One Is Not a Lonely Number by Evelyn Krieger (YM Books, an imprint of YALDAH Media, Inc.), and Black Radishes by Susan Lynn Meyer (Delacorte Press, an imprint of Random House Children’s Books). For Teen readers, the Honor Award Winners are: Hush by Eishes Chayil (Walker & Company, a division of Bloomsbury Publishing), Once by Morris Gleitzman (Henry Holt and Company), and Life, After by Sarah Darer Littman (Scholastic Press, an imprint of Scholastic, Inc.). In addition to the medal-winners, the Award Committee designated twenty-seven Notable Books of Jewish Content for 2011: thirteen in the Younger Readers Category, seven in the Older Readers Category, and seven for Teens. Notable titles, and more information about the Sydney Taylor Book Award, may be found online at www.SydneyTaylorBookAward.org. A blog tour, featuring interviews with winning authors and illustrators, will take place in early February, with participation from a wide range of children's literature, family interest, and Jewish blogs. The blog tour schedule will appear on the Association of Jewish Libraries' blog "People of the Books" at JewishLibraries.org/blog. 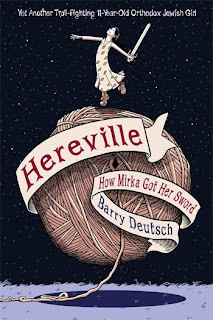 I met Barry Deutsch, author of Hereville: How Mirka Got Her Sword, at Miami Book Fair International in November, 2010. Hereville is the 2011 winner of the Sydney Taylor Book Award in the Older Readers Category, the first graphic novel ever to win this prestigious literary prize. For the full list of 2011 prize winners, visit the Association of Jewish Libraries' blog "People of the Books."